The North Carolina Senate released its proposed FY 2017-18 teacher salary schedule this afternoon. Remarkably, the proposal is bad news for both beginning teachers and experienced teachers. As compared to the plan released earlier this spring by Governor Cooper, all teachers would fare worse under the Senate proposal. The Senate proposal, described as providing current teachers with an average raise of 3.7%, would keep the starting pay for teachers at $35,000. Beginning teachers with 0 to 2 years of experience would receive modest raises ranging between 1.7% and 2.4%. Mid-career teachers would fare better. Teachers moving from step 14 to step 15 would receive raises of 8.5%, the highest raises under the plan. Teachers with 25 years or more of experience would have their salaries frozen under the plan. This pay freeze is a continuation of the General Assembly’s recent antipathy towards experienced teachers. Under the Senate proposal, the maximum bachelor’s-level teacher salary for 2017-18 ($51,000) would remain below the maximum bacherlor’s-level teacher salary available in 2007-08 ($52,080). The hostility towards experienced teachers is all the more troubling given research – using North Carolina data – showing that experienced teachers continue to improve student outcomes throughout their careers. The Senate proposal also maintains the five-year salary tiers for teachers with more than 15 years of experience. Barring future-year changes to the salary schedule, teachers at steps 15 and 20 must wait five years for their next raise. Teachers at steps 25 and above would have to wait indefinitely. To the Senate’s credit, they appear to be honest in their general description of the proposal. My calculations indicate the average raise for existing teachers will be closer to 3.77%. Rather than rounding up to 3.8%, Senator Berger described the plan as a 3.7% raise. However, that’s where credit ends. According to my calculations, funding the Senate’s 2017-18 teacher salary plan costs $144.1 million. The Senate budget only provides $130.9 million. At this time, it’s unclear why there is a discrepancy. 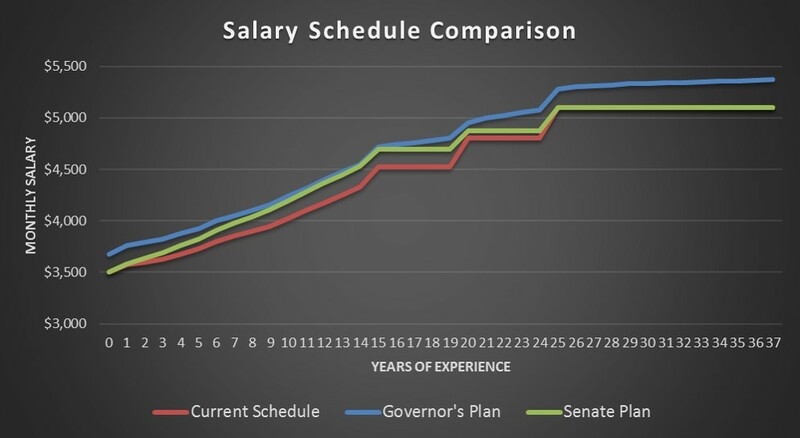 The Senate proposal looks particularly weak compared to Governor Cooper’s teacher salary plan. The Governor’s plan would provide current teachers with an average raise of 6.2%. Teachers at every level of experience fare better under Governor Cooper’s plan. Notably, the Governor’s proposal increases the starting salary to $36,750 and raises the top bachelor’s-level salary to $53,700. If teachers continued to receive the 3.77% annual increases proposed by the Senate, North Carolina’s average teacher salary would likely pass the national average in 2026-27. By contrast, if teachers continued to receive the 6.2% annual increases proposed by the Governor, North Carolina’s average teacher salary would likely pass the national average in 2021-22. Unfortunately, any plans to raise teacher salaries where they need to be remain hamstrung by the General Assembly’s continued preference for tax cuts directed at corporations and wealthy North Carolinians. North Carolina’s teacher wage competitiveness – how teacher salaries compare to salaries of other college graduates in the state – ranks 49th in the country. Policymakers need to reconsider their revenue policies if they would like to have a teacher pay system that will attract and retain the best and the brightest.